Teater Ekamatra staged Geng Rebut Kabinet (GRC), a play set in another Singapore, vastly differing in form but in essence, unchanged. We see this Singapore through the lens of protagonist Catherine Seah, the minority Chinese candidate contending in Chai Chee-Commonwealth GRC and her attempt to defend Chinese rights in a world of Malay SAP schools, walls plastered with words in Jawi (the Malay script rendered in Arabic), and Malay-dominated armies ever ready against the ever-looming threat of China, roughly an entire sea away. Substitute the words Malay with Chinese, and you get Singapore really. In recent years, such statements have increasingly made their way into societal discourse. In Singapore personalities like Sangeetha Thanapal (creator of a blog recounting instances of Chinese Privilege) or Adeline Koh (writer of ‘To My Fellow Singaporean Chinese: Shut Up When A Minority is Speaking’) have propagated the notion of Chinese Privilege: the idea that Singaporean Chinese are institutionally and socially at an undue advantage as the majority race. Chinese privilege is inclusive of both obvious advantages and hidden ‘perks’ that offer a Chinese person greater opportunities to achieve success. GRC itself, written by eminent playwright Alfian Sa’at pokes fun at Singaporean Chinese Privilege, and is a forceful exercise in empathy for many. Concepts like these along with terms such as ‘tone-policing’ and ‘white man rage’ collectively constitute the language of privilege, that seeks to carve out a space for minorities to ventilate their viewpoints, viewpoints which are arguably whitewashed or that simply go unnoticed due to the sheer lack of societal awareness and concern. A play like GRC is an example of a piece that seeks to alert us to Chinese Privilege. I watched GRC while trying to figure out how myself to broach the issue of Chinese Privilege to my friends: I was already in possession of a firm preconception before the play: I unabashedly and wholeheartedly believe that Chinese Privilege 1) exists, and 2) is an endemic problem that we need to address. This is something that induces affectionate eye-rolling from some of my friends, indifferent acquiescence from others at seeing my sublimated rage, and of course for some, an underlying layer of instinctive discomfort and exasperation at my irritation. Of course, that qualifier is often followed by a comment which sounds racist. So conversation about race in Singapore either does not exist at all, or when it does exist operates within the parameters of our qualifiers to avoid anyone getting offended. Conversation, which in other words offers no real insight into the situation at hand. But plays like GRC actively challenge this reality. They encourage us to think and speak openly about racial issues. Even more importantly we are encouraged to speak with the conviction that what we’re talking about matters- that we aren’t kicking up a fuss over nothing or making trouble for a society which practises meritocracy and multiracialism. Having frank discussions about issues of race and religion isn’t incompatible with, or antithetical to multiracialism. In fact, I’d say multiracialism means that we can talk about these issues maturely, openly and comfortably. It means I can talk about Chinese Privilege without having the conversation awkwardly steered away to other topics. It means that Calvin Cheng, Alfian Sa’at and Sangeetha Thanapal can all speak in the same common space and vocalise their opinions, and perhaps, guide us towards some societal compromise. Some may find that disruptive, or overly troublesome, but consider the alternative: a silence that offers nothing. Plays like these only made things worse. Chinese privilege definitely exists, but to equal the state to a particular race is ridiculous. True equality is hard to achieve, some things are rooted in society, you cannot simply wave a wand and legislate them away. Just look at the idea of women serving NS, that’s across all races. Approximately 90% of the women rejected serving. But they’re very keen for men to serve because it apparently makes male enlistees better people. Yet the same idea it would improve the women is not going to be accepted. Now look at the race issue, it’s a fact that’s glaring in our faces, the people who actually have been convicted for reasons pertaining to terrorism, are all malays/muslims. And as glaring as it is, it’s racist to be brought up. Not because the chinese won’t talk about it. Chinese do talk about it. Just not with malays. 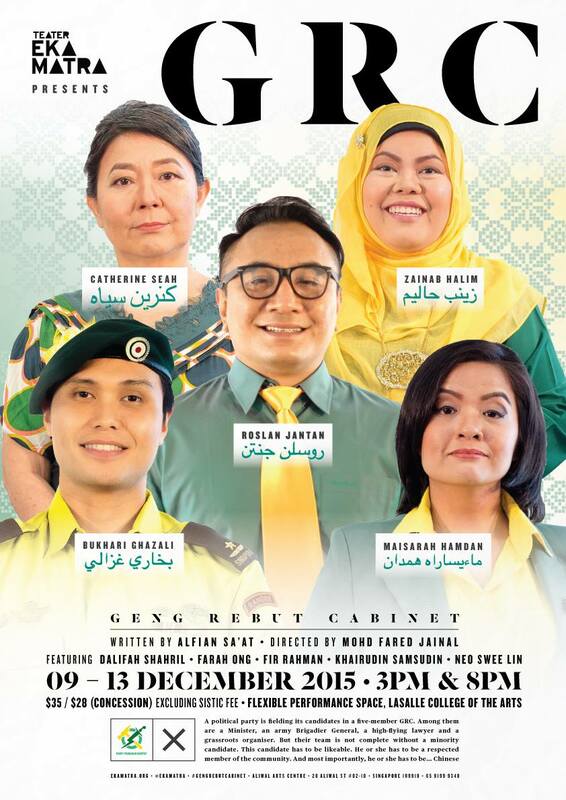 The play mentioned in the article, it splits things clearly and cleanly across chinese/malays. Recently after the elections a suggestion surfaced and people who are largely neutral in the pap vs opposition fight are actually supportive of tharman as the next pm. Why are indians more acceptable than malays in leadership positions? And by ratio alone, way outnumber the malays at the highest levels. Be it public or private sectors. Like aware, these anti chinese privilege fighters often used racist POVs as Counterpoints making their stand much harder to accept. If your method of making people listen is to elevate your own voice above others either artificially by law or insisting others shut up, you go against the ideal of equality between races. Who would take your argument seriously then? No matter the race, no one takes the words of anyone who argues for anything seriously if they’re not going to walks the talk. And one more thing , the pap govt was actually a minority government when it started , filled with English speaking chunese . It’s very possible the type of chinese favored are still a minority .